The last month of Groundwork saw Francis Alys' film at CAST in Helston give way to a double-bill by Andy Holden*. Both of Holden's works used the form of the thirty minute TV documentary as a spring-board for something more poetic and aesthetically interesting. A Natural History of Nest Building (2017) was created with Holden's ornithologist father who once made TV shows with bird-watcher Bill Oddie. Both father and son appear in the film, on opposite sides of a triptych of screens, Holden junior with his brown jacket, large lapels, beard and shoulder-length hair looking like an Open University lecturer from the 70's. He talks earnestly, perhaps over-earnestly, to the camera about nests and nest-building, and whilst there is novelty in the notion of artist-as-tv-presenter, this is not mere parody: the film itself is made with tenderness and care, and with total respect towards its subject matter. Make no mistake, the birds and their extraordinary nests are subject of the work, not the artist or his father. 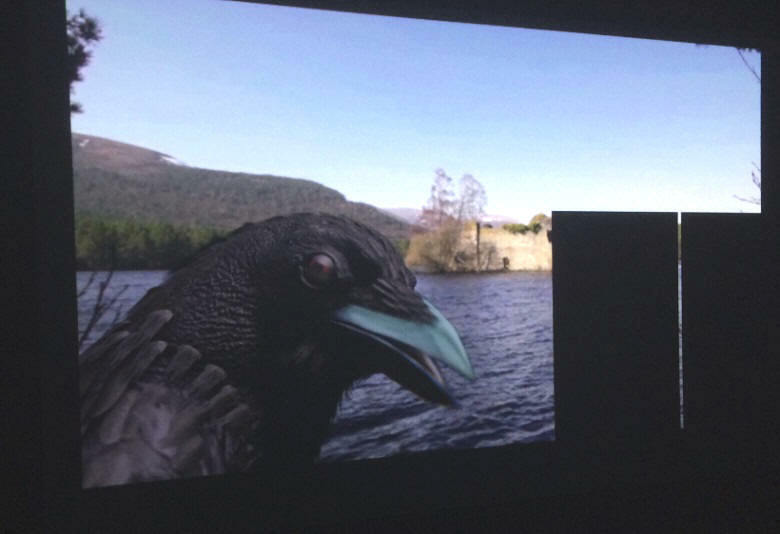 The Opposite of Time (2017-photo below), which tells the story of egg-collecting in Britain, uses an animated crow with smouldering red eyes - who speaks with the voice of Andy Holden - as its narrator. The crow appears against a backdrop of landscape paintings by the likes of Eric Ravilious, Paul Nash and Ben Nicholson: modernist artists active between the wars at a time when egg-collecting was still popular, and hadn't yet been made illegal. As the narrator explains, this changed when legislation came in (in 1954) after which egg-collectors were demonised and went undergound. The Opposite of Time is the more immediately engaging of Holden's two works. It's a fascinating story, that demonstrates our changing attitude towards scientific methodologies and animal conservation and, like the best dramas, has a plot-line full of conflict and jeopardy. 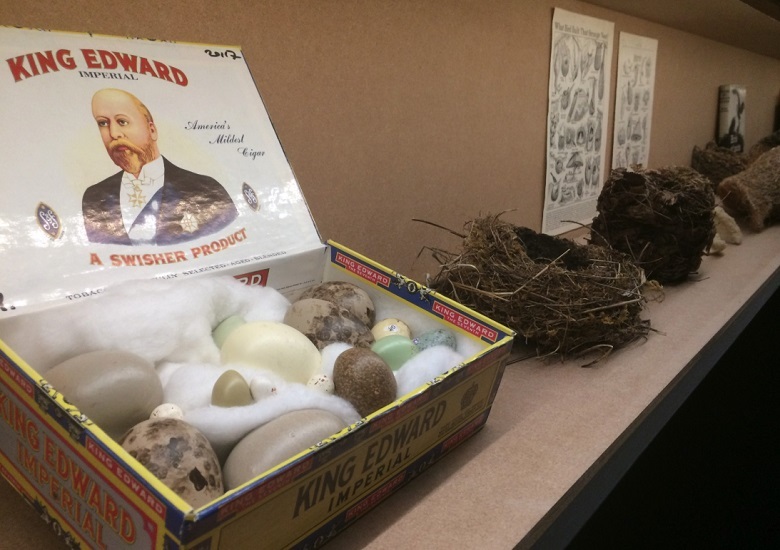 Both films were complemented by a display of eggs and nests in the corridor outside the gallery space (photo above). Alongside artists like Holden, who is from the South East, Cornwall-based artists and musicians appeared, and were generally more visible, in the last weeks of the Groundwork programme. At the very beginning of September Liam Jolly and Rosanna Martin curated a show in a small, but bijou, new exhibition space, The Auction House in Redruth. For 'Where it is there it is...' (a title referring to the esoteric process of finding tin) artist-participants in Teresa Gleadowe's Cornwall Workshops were asked to contribute works by email, most of which were printed off and displayed in some way. The walls were also stencilled with URLs to websites and videos nominated by the artists, and the result felt deliberately transitory, like a staging post or a sign pointing elsewhere (see 'interviews' and 'exhibitions'). Like Where it is there it is..., much of the preceding Groundwork programme had acknowledged, in some way the richness of Cornwall's unique landscape and industrial heritage. Naomi Frears' 'All Going Nowhere Together' was tinged with nostalgia for a different, more recent past, however. On a sunny Sunday morning drivers from all over the region converged on a car-park on the Cornwall College campus in Poole. 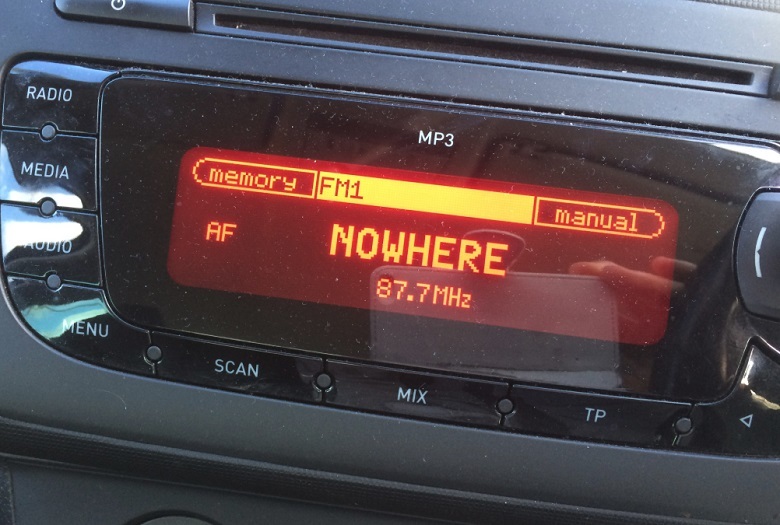 They had been pre-instructed, by email, to tune into a radio FM station 'Nowhere', which was playing recordings of the DJ-musician Luke Vibert discussing his early career in Cornwall, and his subsequent association with ambient house music, John Peel, Aphex Twin and Rephlex Records. After car park attendants had finished positioning around 100 cars in an interlocking grid, two tracks by Vibert - one a bossa nova complete with Hammond organ sounds, the other especially commissioned - were beamed through their radios, and the drivers were asked to shuffle backwards and forwards, into and out of their allotted parking bays. Amidst the exhaust fumes and bright sunlight, this clunky futuristic ballet was dizzyingly hypnotic and the effect, at least as seen from the drone camera overhead, rather beautiful. Marc Augé coined the term 'non-place' to describe generic urban environments like car-parks, airports and shopping malls. Certainly the setting lent the work a strange, disconcerting quality. 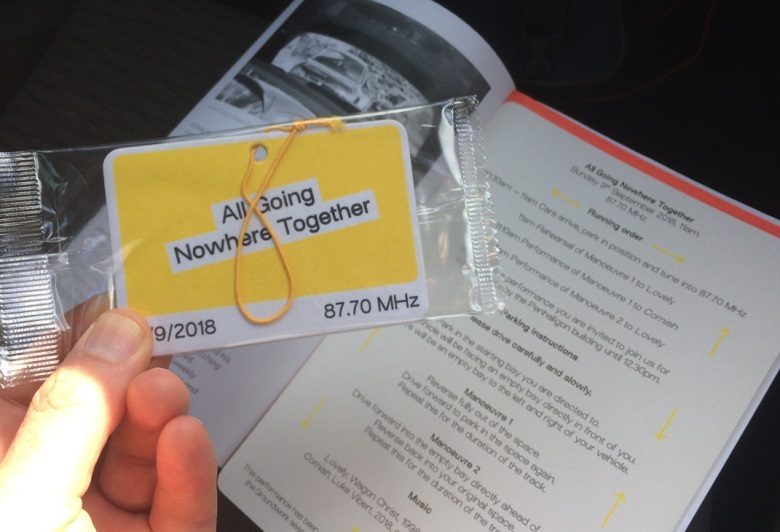 The participating drivers and their passengers, recognising its absurd humour, still seemed to enjoy themselves and the spontaneous, noisy hooting of horns that greeted the completion of each choreographed sequence, reflected this. Other events in September included a special live concert by St Keverne Band organised by Abigail Reynolds for an exclusively boat-bound audience at Tremayne Quay, and a return visit for Adam Chodzko's haunting kayak-work Ghost. As promised, Groundwork successfully brought a range of international art and artists to Cornwall. It did so with panache and conviction, and all the works seen during the previous six months showed a high level of serious intent. The closing celebration brought humour and silliness, however, and in this sense couldn't have been more different. Held on the last day of September, it took place in the unadorned and slightly sweaty surroundings of Falmouth Rugby Club. Whilst barmaids pulled pints at the bar, local bands strong on visual or comedic content, namely Shagrat, Disco Rococo, Splash Addict and indefatigable Cornish rappers Hedluv & Passman, played at one end. Then, at about 10PM, Martin Creed appeared on stage. 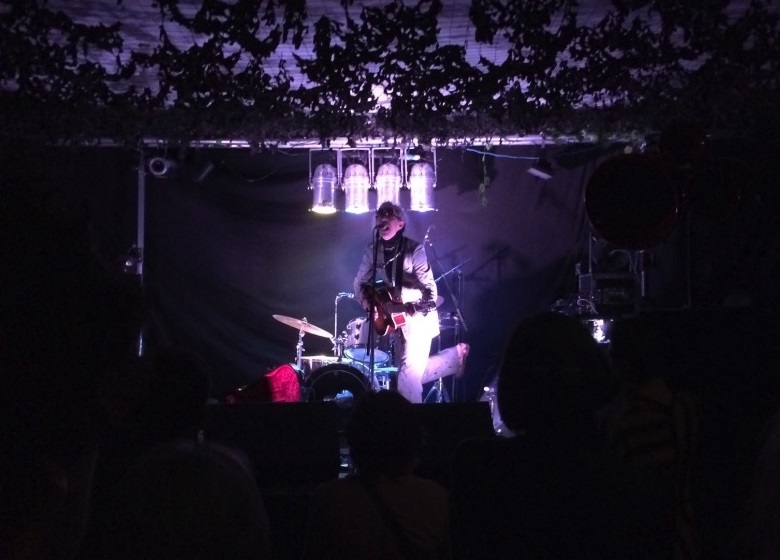 Strikingly tall, and wearing an artfully paint-spattered suit, the Scottish Turner Prize winner played a set unaccompanied on a twelve string guitar, occasionally using effects pedals for extra interest. His songs are inventive, quirky and unconventional, and display a surprisingly high degree of craftmanship: something more deliberately concealed in his visual art. * Holden had first appeared in Falmouth in early May with the live performance Laws of Motion in a Cartoon Landscape.